Biology majors study the behavior, classification, and evolution of living entities called organisms. This natural science encompasses specialties such as microbiology, marine biology, ecology, zoology, physiology, cellular and molecular biology, and botany. Students can earn Associate, Bachelor's, Master's and Doctorate degrees. 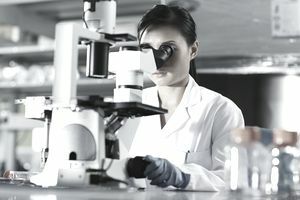 After earning an undergraduate or graduate degree in biology, some students enter professional health science programs including those in medicine, dentistry, podiatry, optometry, and veterinary science. *Includes only career options for those who graduate with a degree in biology. This does not include options that require earning an additional degree. Individuals who have earned biology degrees typically work in laboratory settings. Those with advanced degrees, for example, master's or doctoral degrees, do independent research. Biology PhDs may teach in colleges and universities. High school students who are thinking about studying biology in college should take courses in all science disciplines, for example, chemistry, physics, and earth science, as well as in math. This will provide a foundation for their college coursework. This major is also referred to as biological sciences. Related majors include biochemistry, bioengineering, and neurobiology. Students who plan to continue their studies in biology in graduate school should earn a Bachelor of Science (BS) degree. A Bachelor of Arts (BA) degree is appropriate for students who plan to pursue graduate studies in another academic field since, as a liberal arts degree, it is more broad-based. While there are jobs available for individuals who graduate with an associate degree or with a Bachelor of Science (BS) or Bachelor of Arts (BA) degree in biology, students who earn a master's or doctoral degree have a wider range of opportunities from which to choose. To qualify for a job that involves doing independent research, one typically needs a doctoral degree in Biology. Those who want to earn an advanced degree in the health professions often earn a bachelor's degree in biology first. Getting as much laboratory experience as possible—through internships and by working with professors as a student assistant—can improve your chances of getting into graduate school and of getting a job.